It's finally that time of year again, when it may drop below 80 degrees in Baton Rouge. So it's soup time! I'm just going to start off by putting new reviews here; maybe I'll categorize them eventually and join them with the others to aid soup investigators. I started the season with an autumn-y Lentil Vegetable from one of our top performers so far: Amy's. It's very sweet, kind of cinammon-y. 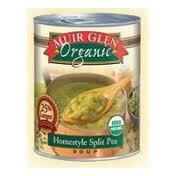 It has potatoes, carrots, lentils, spinach, and maybe 3 pieces of green bean per can. 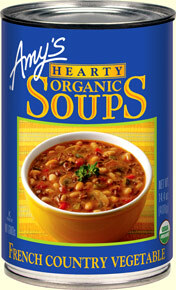 It was good, but not my favorite Amy's soup so far, I think because of the sweetness and because it's not very many vegetables to be called Lentil Vegetable. The lentils are very good, but not amazing, and no other vegetable really stands out here, except the potatoes, which were authentically potatoes enough to have a little skin on some of them, and not overly mushy. I had an inspiration for adding to the soup-- plain yogurt on top. 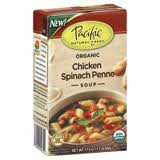 Very good this way; it combats the sweetness and makes the soup taste richer. I had some leftover the next day--it was good cold. Overall, this one gets a B+. Kind of like having a "sensible" meal with your fifth grade teacher, but I liked my fifth grade teacher, so. Pinto beans, barley (wonderful barley), zucchini, tomatoes, onions, mushrooms, red pepper. The broth tastes buttery (in a good way) and there’s a hint of tomato, just a hint. A- —the only reason it doesn’t get an A+ is because I might have preferred fewer beans, but maybe this is what distinguishes it from other vegetable soups and makes it “French Country Vegetable.” Like strolling through the town square searching for a good Bourdeaux or a nice scarf for Maman. 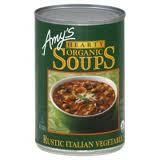 Go here to see a review of another, very good vegetable soup. 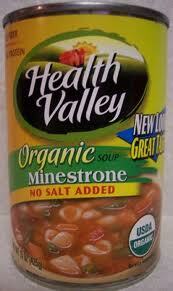 Go here to read about some better minestrone. The only soup I’ve ever seen with kale—and I could actually tell it was kale, saw the ruffles in the leaves. Amazing! Broth has a buttery, tomato-y flavor. It had chick peas which were good but a little undercooked perhaps, a bit tough or chalky, but not completely offensive; chick peas are sometimes just like that. The tomatoes are good and there’s small pieces of zucchini, onions, mushrooms. It’s all held together by some awesome barley. Overall, this is a very good soup. A- (I only give it a minus because of the chick peas, which were, like I said, still ok.) Like lunch in a little trattoria in the middle of your fresco painting workshop.